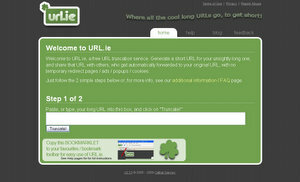 URL.ie is a free URL truncation or shortener service. The generated short URL directly forwards you to the original URL with no temporary redirect pages / ads / pop ups / cookies, and it never expires. An interesting cool feature is the generation of a QR Code for every shortened URL, which allows your QR Code device enabled, ounce pointed at the image, to take you directly to the URL. There is another time saving feature, not so visible though, when you navigate from a page to URL.ie, right under the URL box there is a link that would automatically add the webpage you came from, really useful, but in my humble opinion the link should be more visible. The service also offers a bookmarklet allowing you to use the service right from your browser.